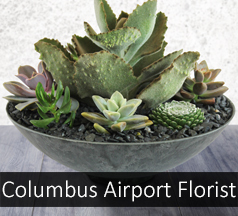 We make more flower delivers to the Columbus airport then even we realized. CMH or Columbus Metropolitan Airport has thousands of visitors going in and out of the airport everyday and of course it requires a tremendous amount of people to manage that. Nothing makes someone working the airport counter happier then receiving the gift of flowers in front of co-workers and hundreds of strangers alike. Can you imagine the feeling it must be to have a huge group of people you don't know say "Ahhhh" when your loved one is handed a bunch of flowers from Flowerama, we can and we have seen it ourselves and it is very special.